So I've being working in-house since the start of 2013 and it's been quite an experience. It's something I've been meaning to do for a bit now, to get the experience of working in-house compared to agency side as I feel it would help with my career as well so here are some of my thoughts thus far on working in-house. A little background on working In-house and Agency side, as a number of people have asked me this quite a few times. In the SEO industry, there's either the option to work for a company and do their SEO only, this would be classed as in-house SEO. This company is your one and only client and you literally live and breathe everything about this company. You work closely with the other departments, primarily/possibly Content, PR, Social Media, Web development/IT, etc. 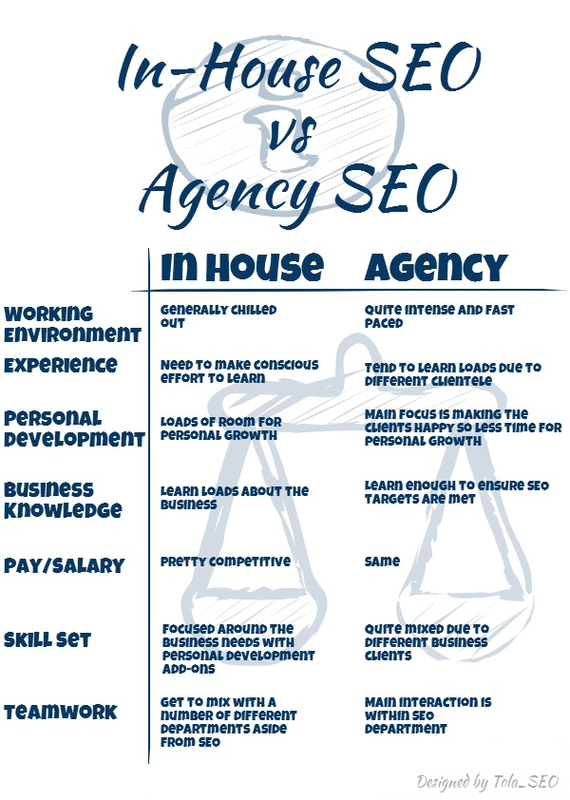 Agency on the other hand is working for a 'digital agency' who would have a portfolio of clients/companies and you get to manage a number of clients from different business sectors working on their SEO usually by having a go to person in the business to liaise with to get stuff done. There's also a lot of opportunity to engage with colleagues all within the SEO industry who have probably worked in other sectors meaning there's the option to pick your colleagues' brains a lot more because SEO is literally all everyone does in the company! Of course a number of agencies now diversify and Web dev Content, PR teams as well, but the primary business focus is SEO and PPC. In-house SEO is a whole different ball game! I'm learning everyday it isn't always just about what you know but who as well! Depending on the business, SEO may or may not be at the top of the food chain as some departments might have higher priorities than others, meaning you really need to interact with a lot of other departments and in the process you tend to learn a lot more about the business as a whole, and of course, there is a lot of time for this because this is your one and only client - your bread and butter really! Sometimes things can take time to move along as projects are usually integrated with other departments meaning more sign-offs might be required. This means you just might have more time on your hand, and if you're lucky and smart you can do a lot of personal development courses and projects because there's always so much more time to growth. To make things a little clearer because really I could go on and on, I've created a little comparison table so you'd have an idea of what I'm talking about. I've got my facebook fan page which is another way to get updates about my blog. So please 'like' my Tola SEO page or follow me on twitter. Thanks!